What Should Congress Do After Hobby Lobby? 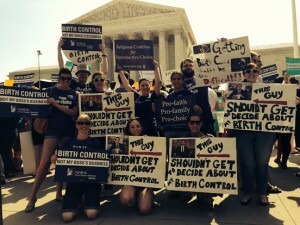 What can – – – and should – – – Congress do after “Hobby Lobby”? You’ve most likely heard about the United States Supreme Court’s divided and divisive opinion in “Hobby Lobby” – – now Burwell v. Hobby Lobby, Inc. consolidated with Conestoga Woods Specialties Corp. v. Burwell – – – on the last day of the Court’s Term in 2013-2014. The majority, in an opinion authored by Justice Samuel Alito, held that closely held corporations (or their owner/shareholders) are entitled to a religious exemption from the federal mandate to provide health insurance to employees that includes contraceptive coverage. But what is getting lost in this discussion is that not only is the provision of contraceptive coverage based on federal laws (“Obamacare” and the regulations passed pursuant to it), but so too is the basis for the religious exemption. The Religious Freedom Restoration Act, RFRA, is the statute interpreted by the Court to provide religious “freedom” to for profit corporations like Hobby Lobby. Importantly, the decision is an interpretation of the word “person” in the RFRA statute, passed by Congress in 1993. Equally important, the decision is an application of the requirement under RFRA that a person’s religion be “substantially burdened.” And perhaps most important, the decision is an application of RFRA’s ultra-strict scrutiny that changed otherwise applicable First Amendment doctrine. Under RFRA, the government interest must be compelling and that interest must be effectuated by the “least restrictive means, even if the government action is a religiously neutral one of general applicability. Given that the Court is simply interpreting a statute – – – and not the Constitution – – – Congress can amend the statute to nullify the Court’s interpretation. Or Congress could repeal the statute – – – a statute meant to change First Amendment doctrine after all – – – in its entirely and restore the First Amendment. Indeed, the repeal statute could be called the First Amendment Restoration Act. Meanwhile, I’ll be more than interested in what New York’s Senator Kirsten Gillibrand has to say. This entry was posted in Constitutional Law, Feminism, First Amendment on July 2, 2014 by Ruthann Robson.